The program versions from v3.0 and onwards are distributed as a self-extracting installer package, which can be run directly from Windows explorer, the Windows run-dialog, or a Windows command-prompt. (5617 kB) QRB & QTE version 3.0 (2003.05.06). This is the latest version, and requires a computer with a Pentium-class cpu or newer, and Windows 98 or newer, to run. An error can occur during installation in Windows Vista and Windows 7, regarding problems registering a file called dao350.dll. If this error occurs, simply click "Ignore" to complete the program installation. 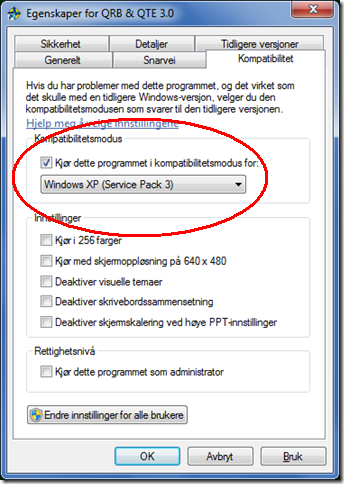 To run properly under Windows Vista and Windows 7, the program shortcut need to be manually modified (right-click - properties) to start the program in "Windows XP sp3" compatibility mode. See this screenshot for some details. The program versions prior to v3.0 is distributed in ZIP compressed files, which need to be decompressed before the program can be installed. If you don't have a ZIP decompression utility, there are links to two decompression utilities below. There are two distribution ZIP files available, one complete and one small version. The complete version includes the two system files VB40016.DLL and OC25.DLL, which is needed by the program, while the small version does not include these two files. If you don't have these two files on your computer (they should be located in your \windows\system directory), then you must download the complete version. If you have these two files, downloading the small version is recommended since it will be much faster. If you are unsure if you have them or not, then you should download the complete version. Click on one of the links below to download QRB & QTE. "small" (180 kB) QRB & QTE version 2.13 (1999.12.18). This version requires a computer with minimum a 486-66 MHz cpu, and 8 MB ram to run. It is however recommended to use a computer with a Pentium class cpu, and 16 MB memory or more, to get the best performance. (29 kB) ZIP decompression utility, by PKWARE. This is a DOS utility, that can be used to decompress the ZIP'ed distribution file of QRB & QTE (see below). 7-Zip ZIP compression/decompression utility, by Igor Pavlov. This is a Windows utility, that can be used to decompress the ZIP'ed distribution file. WinZip ZIP compression/decompression utility, by Nico Mak Computing. If you don't feel comfortable working at the DOS prompt, there are several good Windows programs available for decompressing ZIP files, one of my favourites being the 7-Zip software, which is free for download at this address: www.7zip.org.